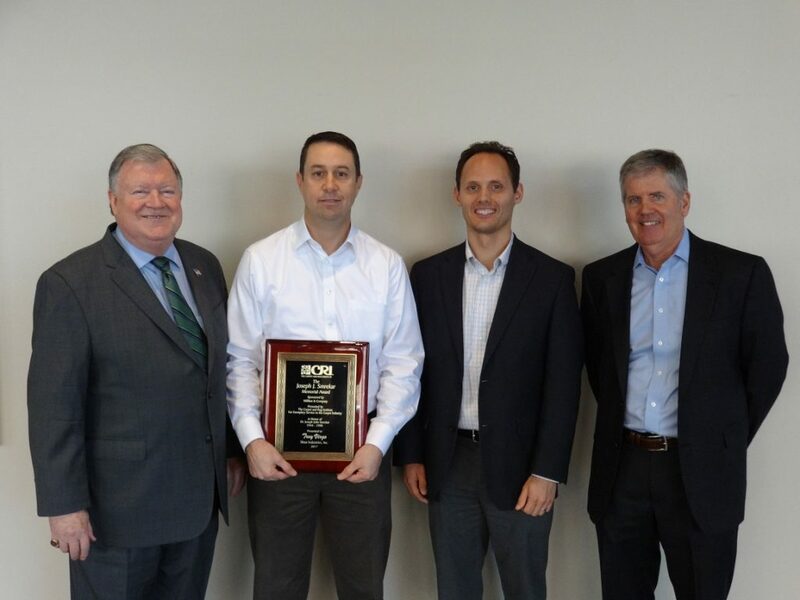 From Left to Right: Joe Yarbrough (CRI), Troy Virgo (Shaw), Mark Strohmaier (Milliken & Company), and Jack Ganley (Mannington Commercial). Dalton, GA – (November 20, 2017) – The Carpet and Rug Institute (CRI) presented the Joseph J. Smrekar Memorial Award to Troy Virgo, director of sustainability and product stewardship for Shaw Industries Inc., at the trade association’s annual membership meeting on Wednesday, November 15, 2017, in Dalton, GA. Mark Strohmaier of Milliken & Company made the presentation of this year’s award. “CRI is grateful for Troy’s deep industry expertise and his willing support of CRI. His participation on several key committees has been invaluable to CRI in support of the carpet industry,” said CRI President Joe Yarbrough. The Joseph J. Smrekar Memorial Award was established by Milliken & Company in 1998 to honor the late Dr. Joe Smrekar who volunteered on many CRI committees. Dr. Smrekar set the standard for service to The Carpet and Rug Institute and the carpet industry. CRI staff members chose the recipient of the annual award. Troy Virgo has served at Shaw Industries for 22 years and has been in positions of increasing responsibility for environmental permitting and regulatory compliance for all of Shaw’s manufacturing and distribution operations. His work at CRI includes participating on the Promotion Panel, IAQ Task Group, LEED V4 Pilot Credit Task Group, Research Documents Task Group, and Sustainability Terminology Task Group.